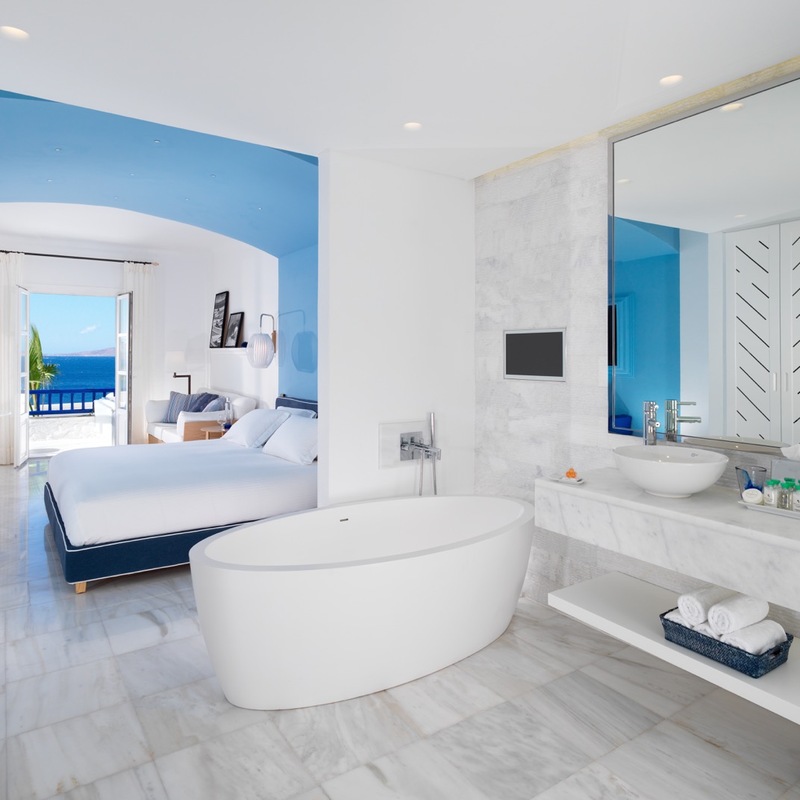 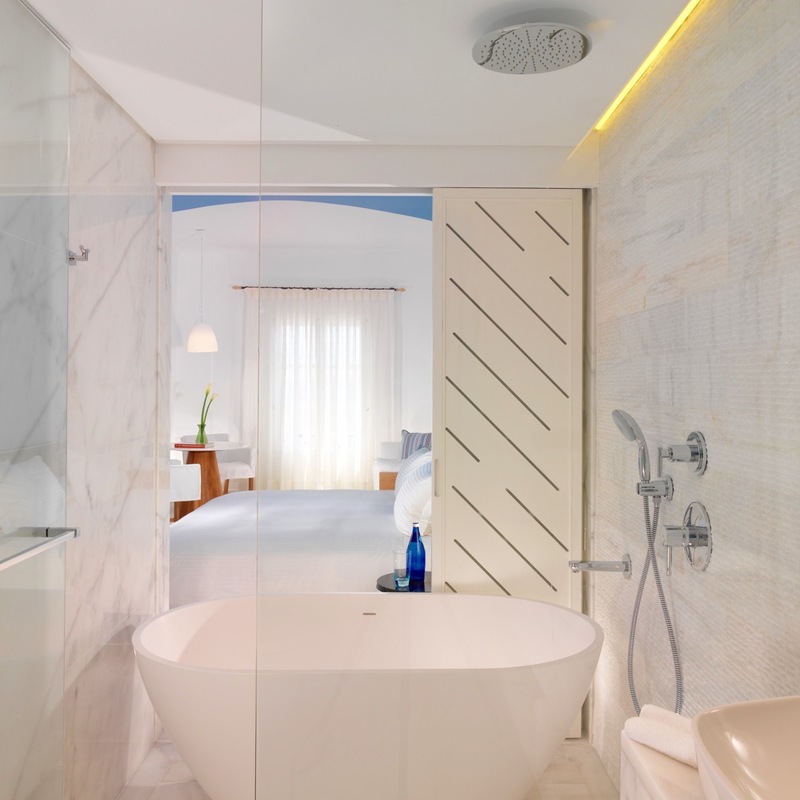 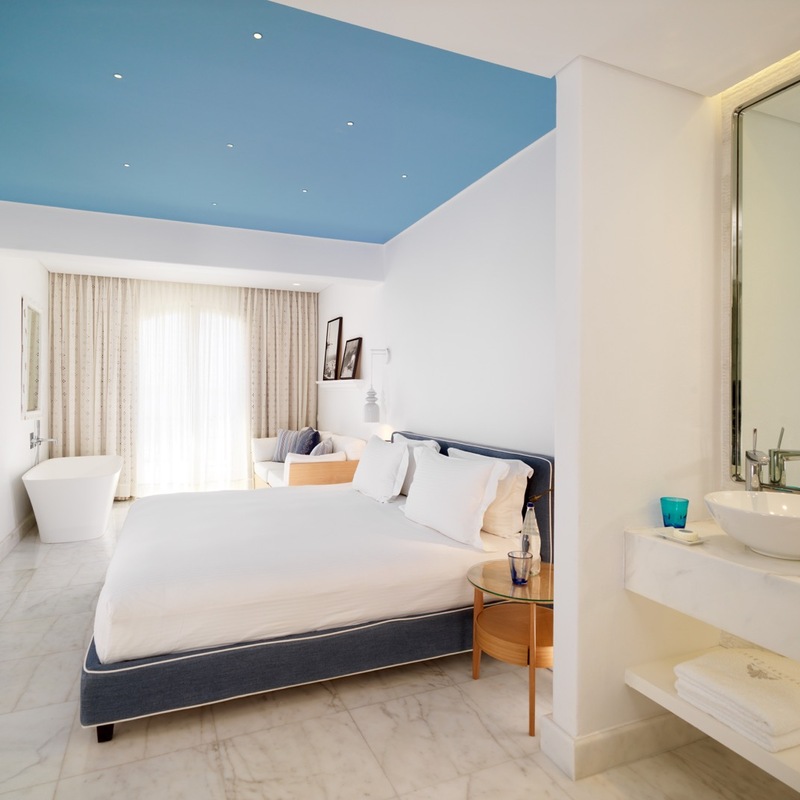 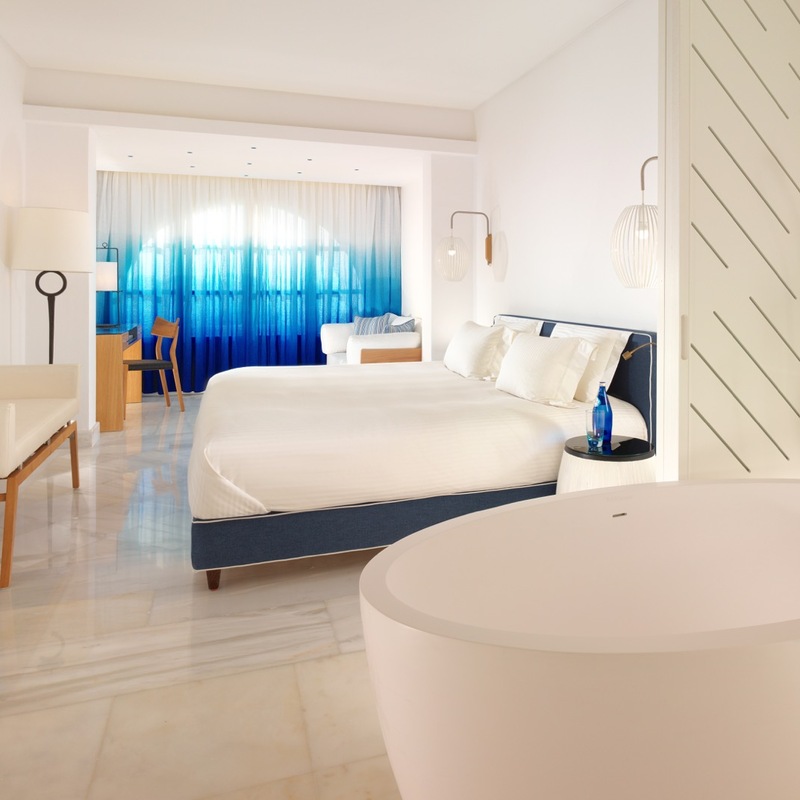 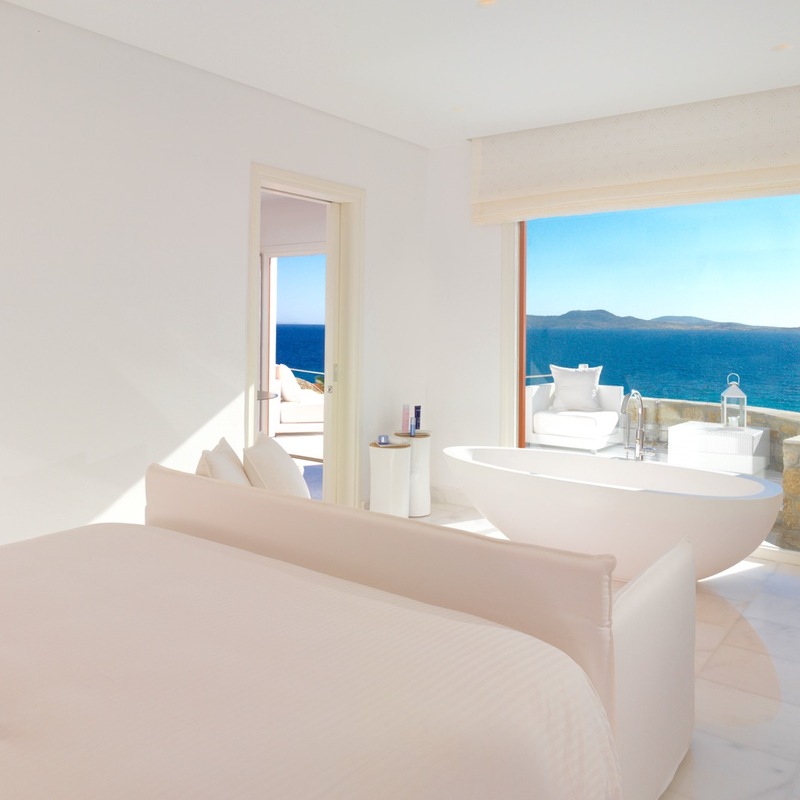 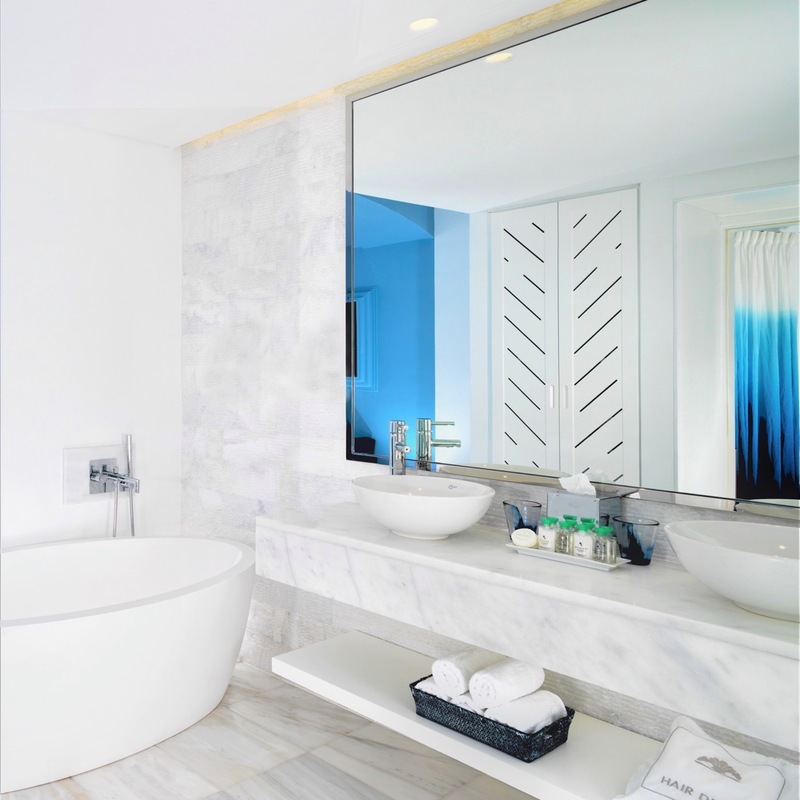 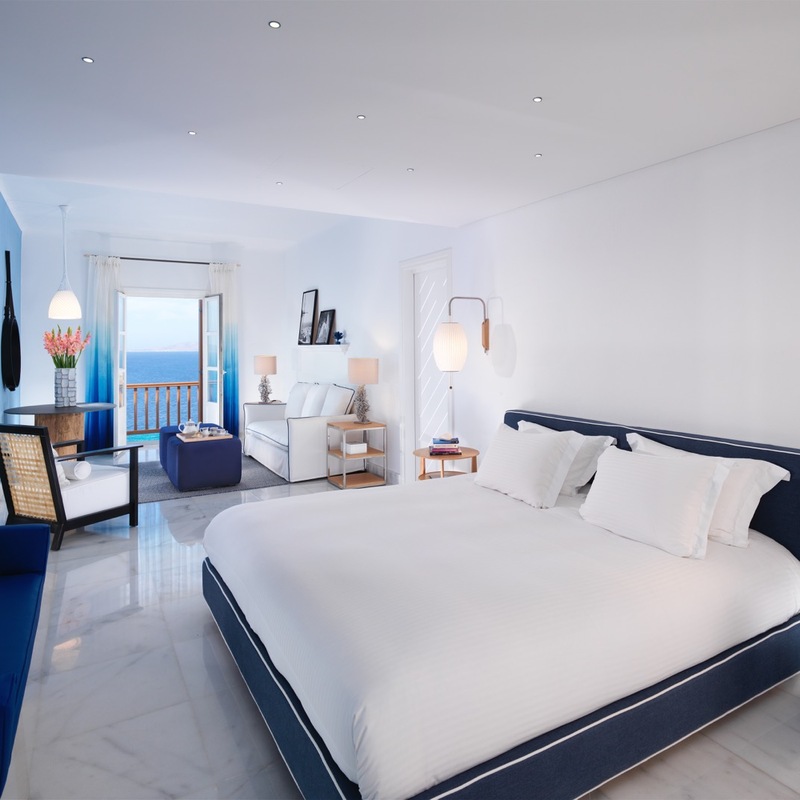 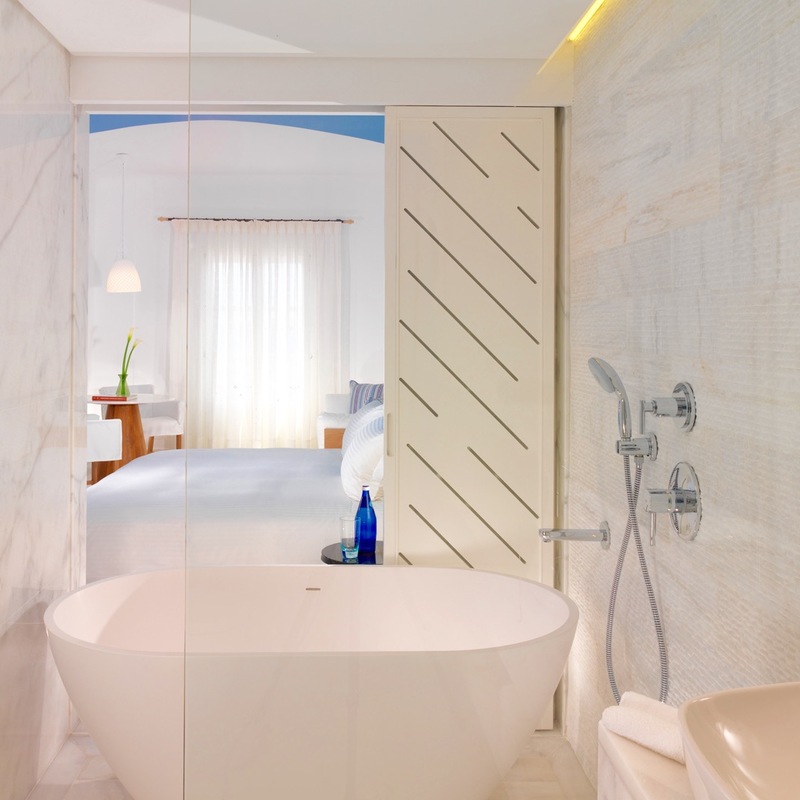 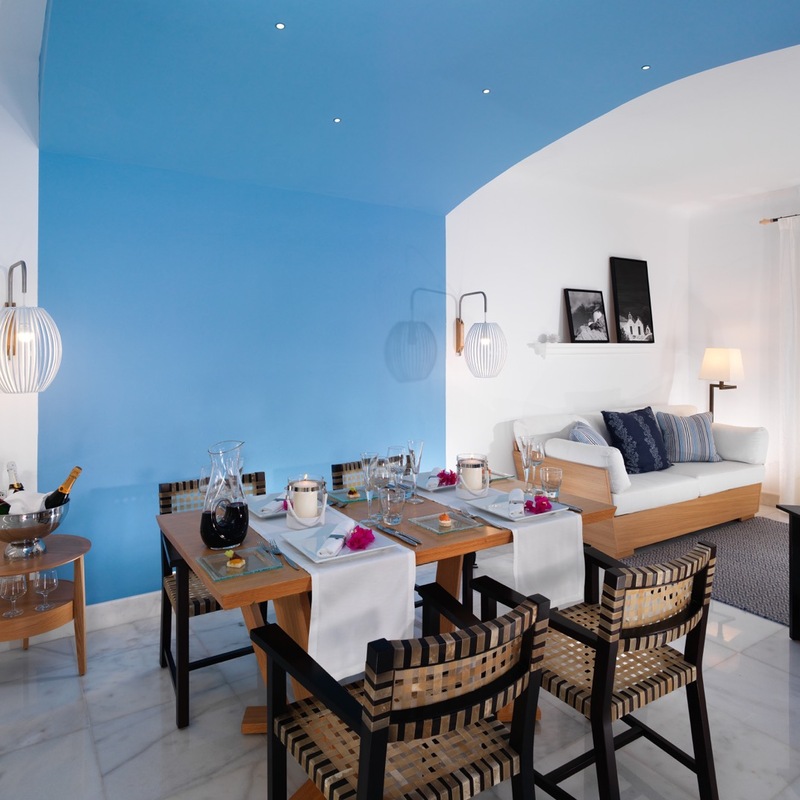 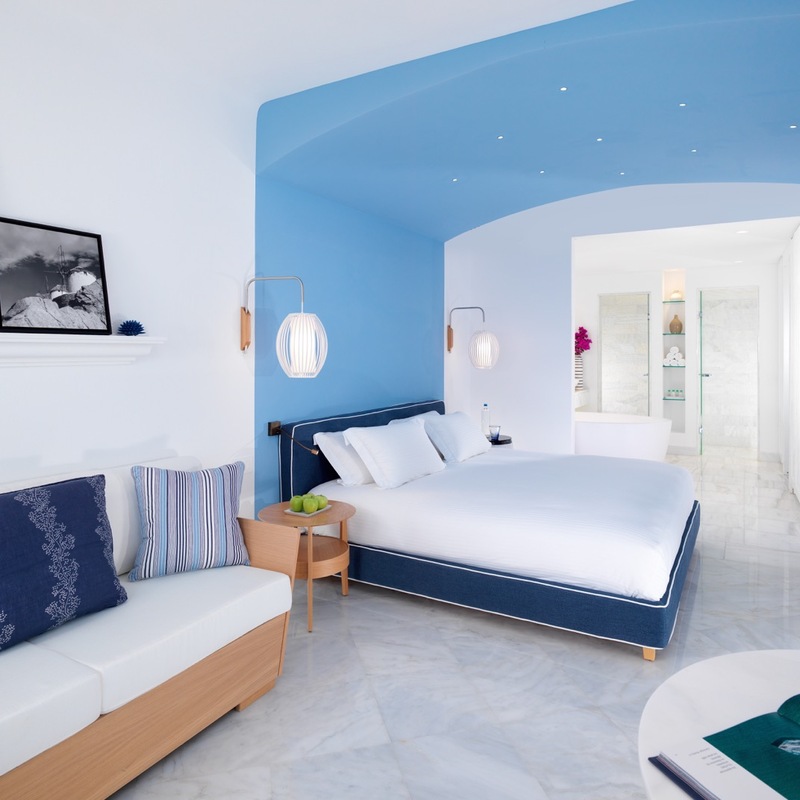 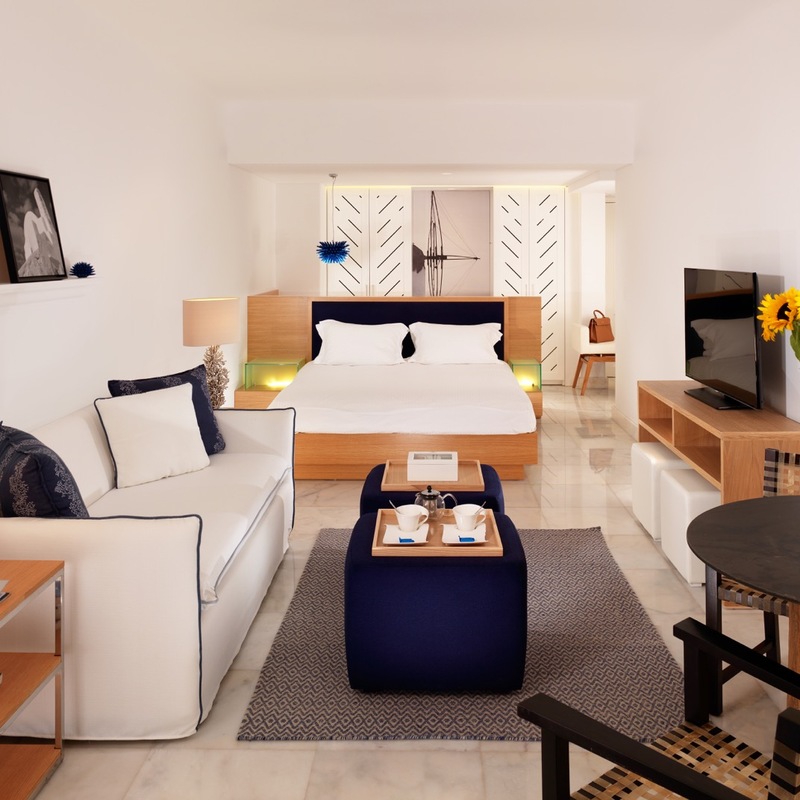 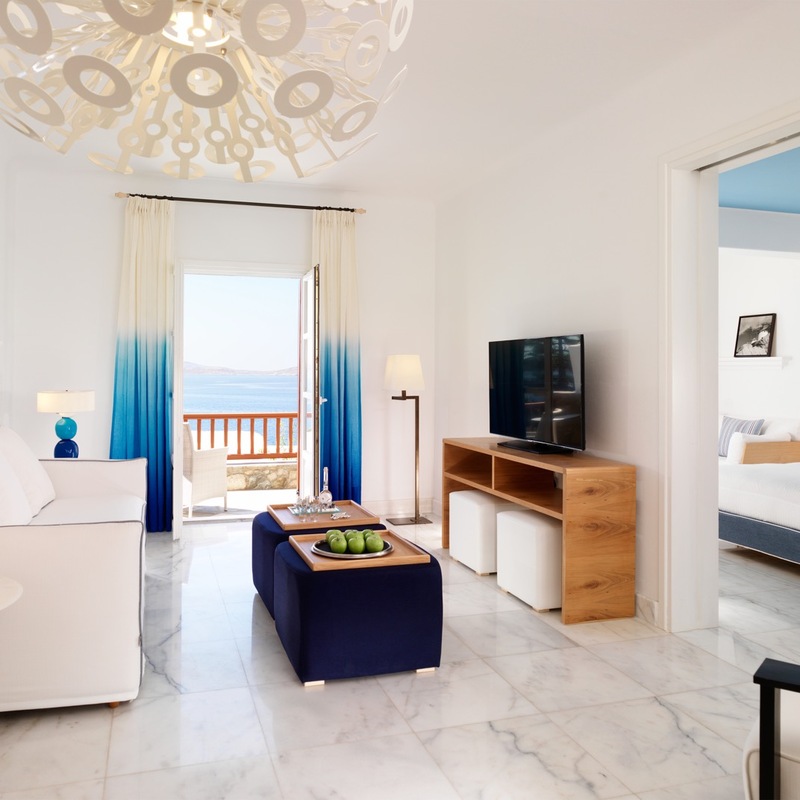 You know what you’re getting into when you book a stay at a luxury hotel on a Greek island, and much of it comes in shades of white or blue. 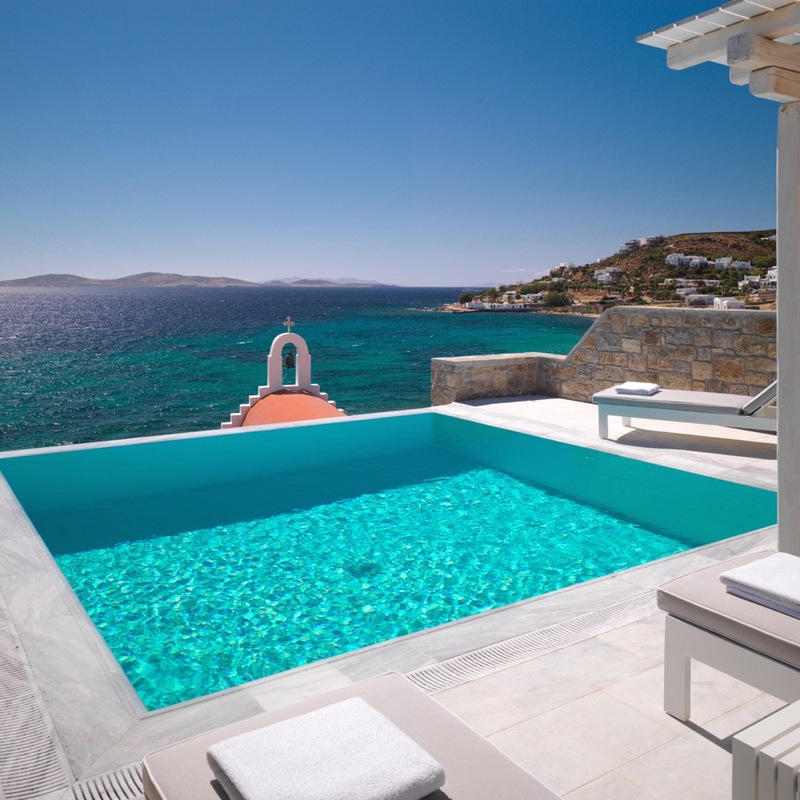 There’s the clear sky and the azure sea, the sparkling infinity pool, the whitewashed stucco and diaphanous drapery billowing in the breeze. 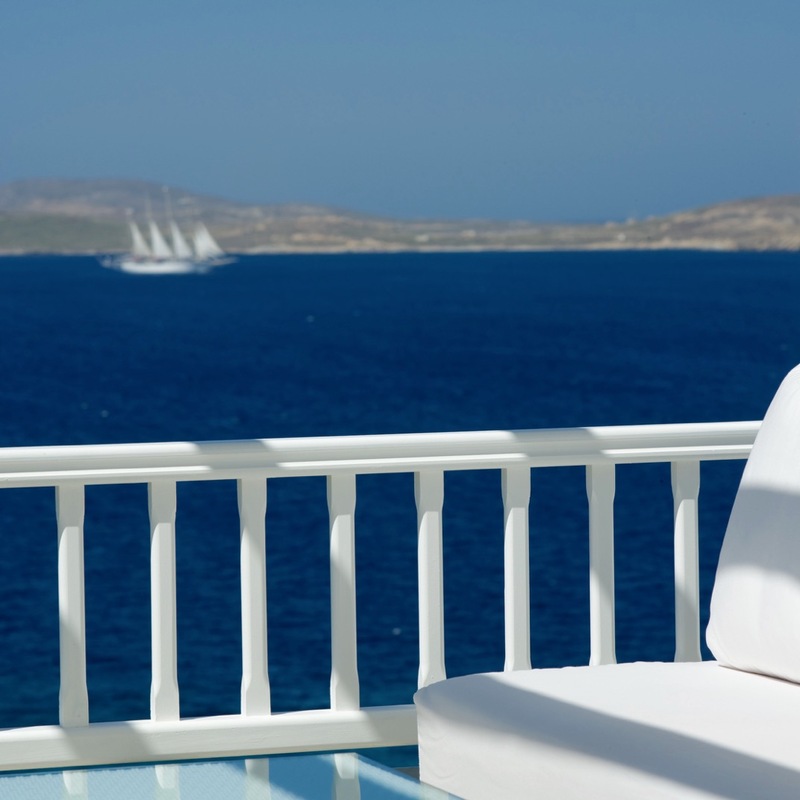 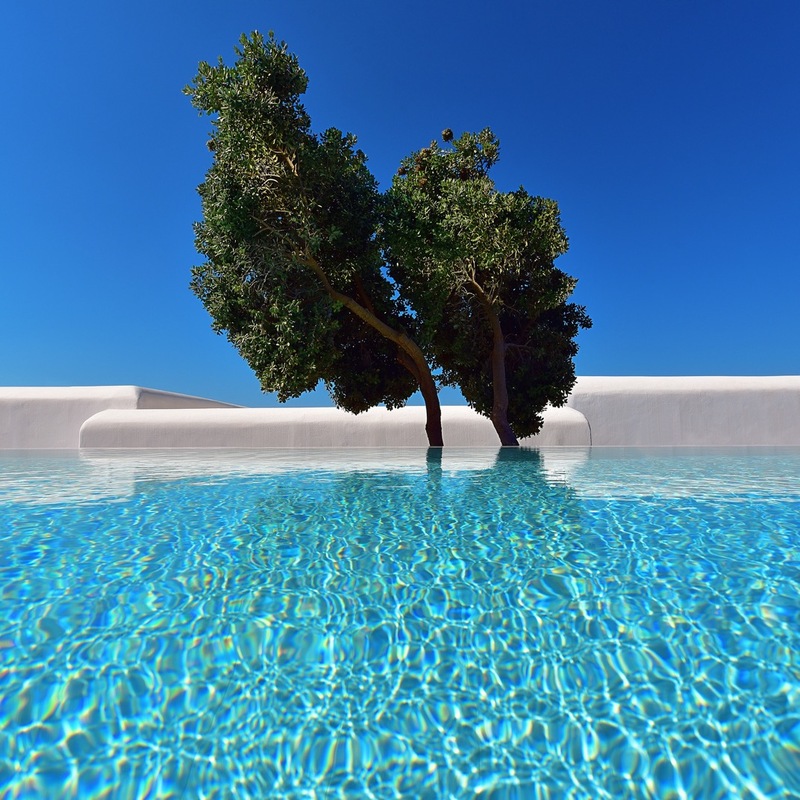 So what distinguishes Mykonos Grand Hotel & Resort from all the other gorgeous resorts on the so-called island of the winds? 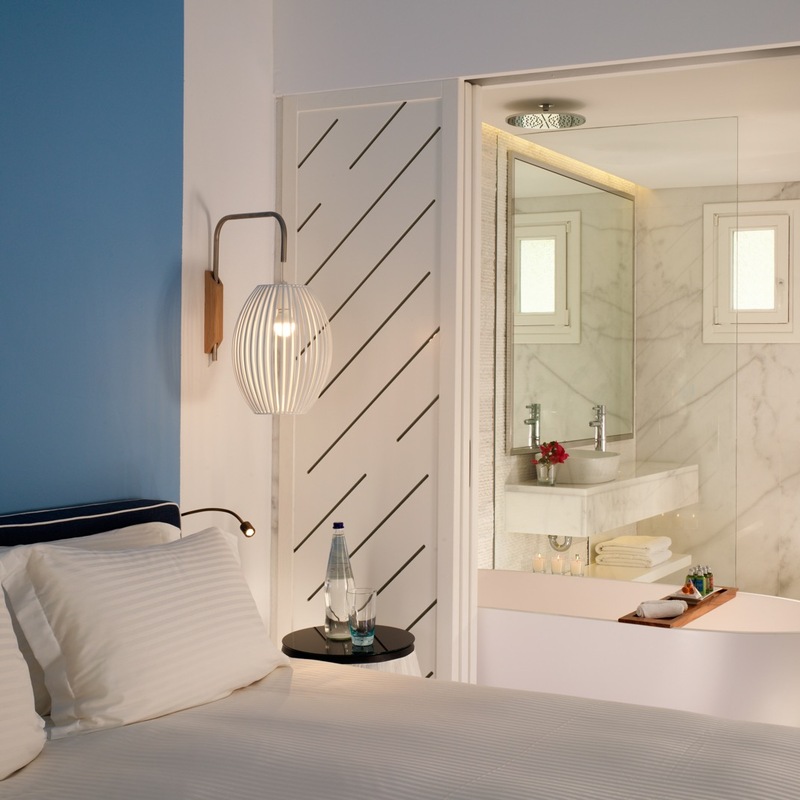 In short, it’s a little extra anticipation of the guest’s needs. 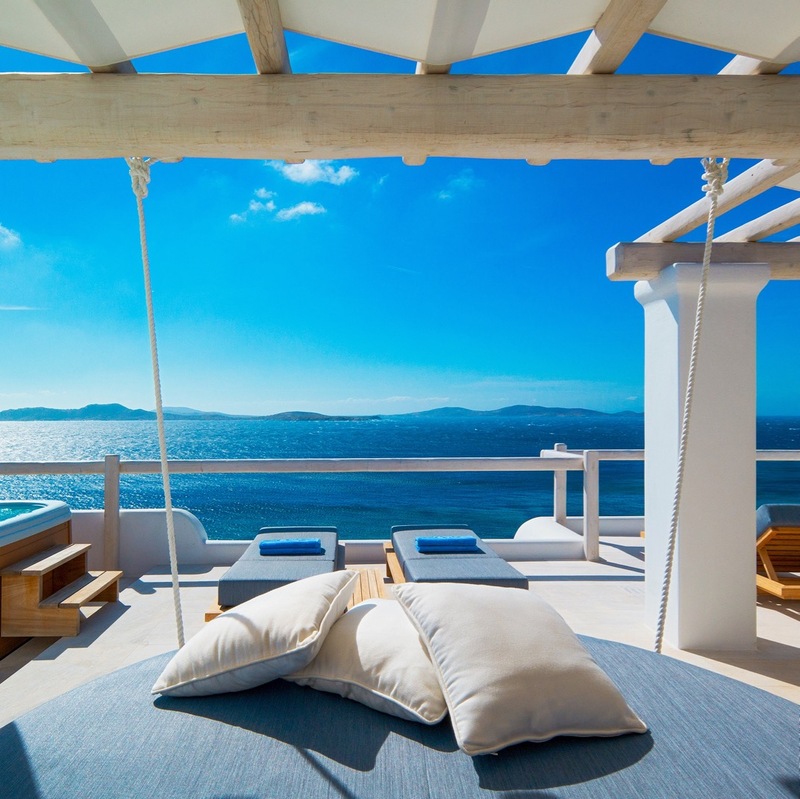 The whole place seems designed, in fact, around who you they think you are — most likely a hard-working person who’s coming to Mykonos on vacation from a stressful job, probably someone who’s accustomed to cramped city living, perhaps someone who practices yoga or goes to the gym regularly. 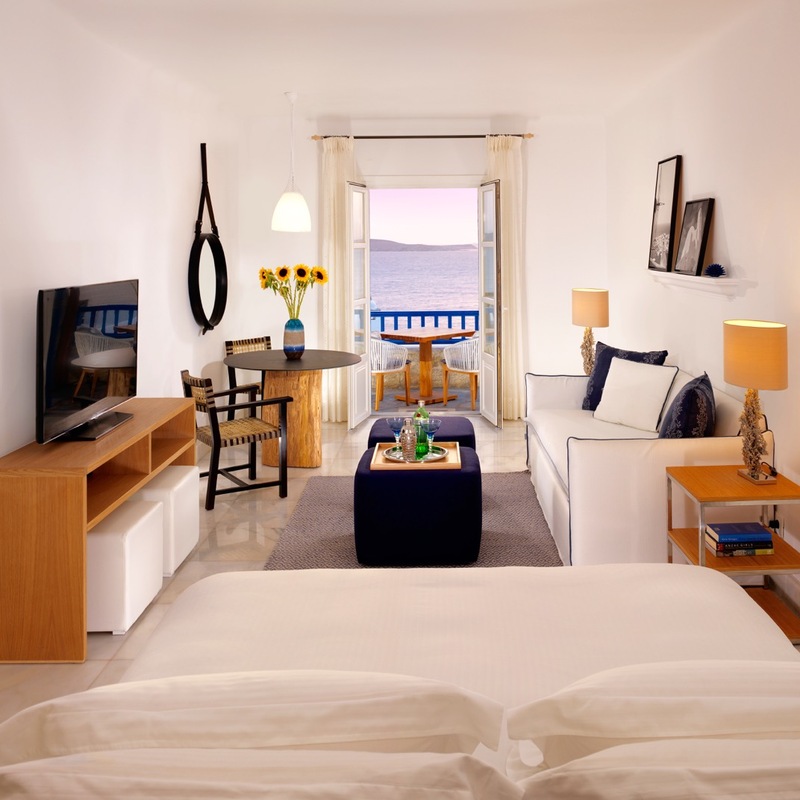 As such, rooms and suites are large, the five-acre property spacious, the staff carefully trained. 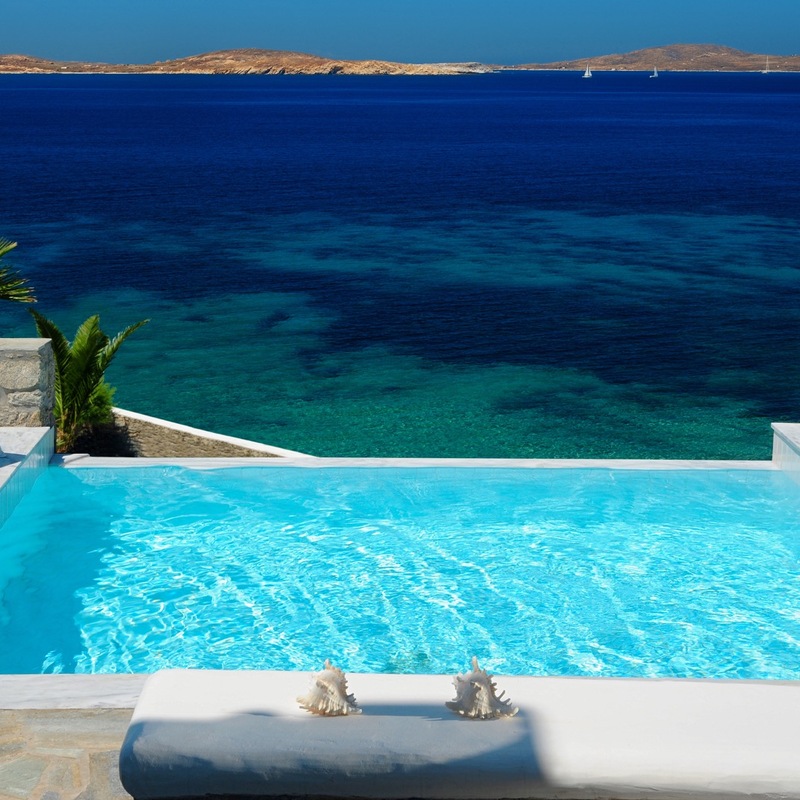 No water sports are permitted on the beach, a policy that pays dividends in terms of peace and quiet. 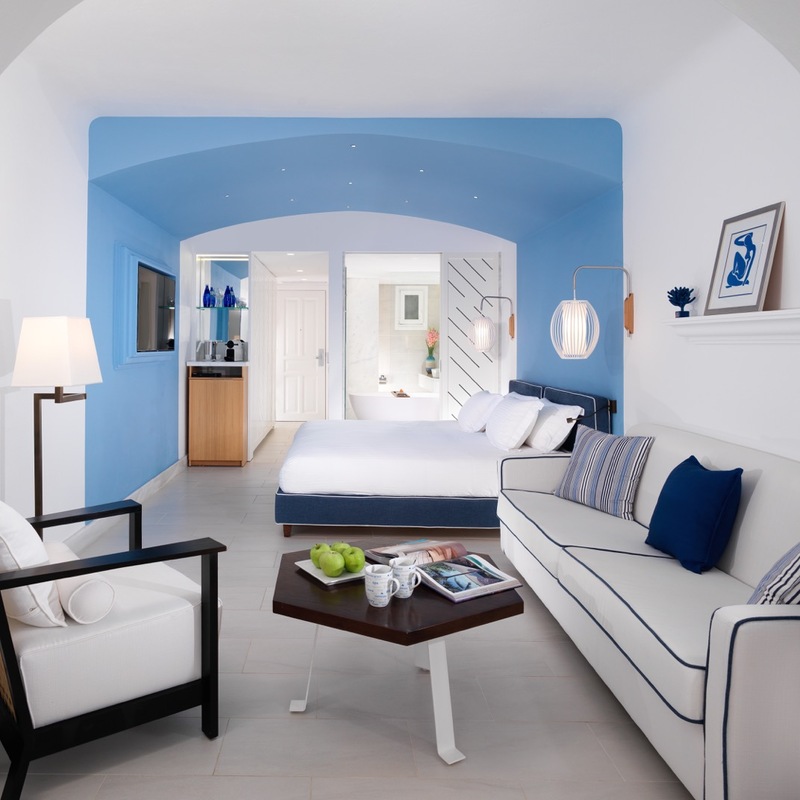 There’s a newly revamped fitness center, tennis courts, a stone amphitheatre where yoga enthusiasts can practice. 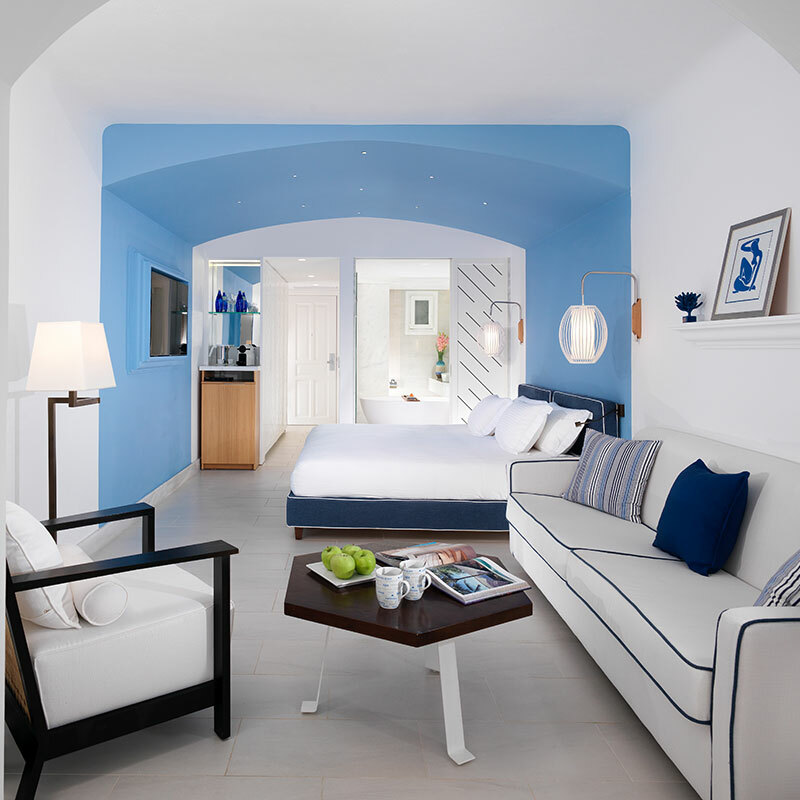 The thoughtful layout makes it easy to unwind whether out and about or inside your room — featuring, naturally, the aforementioned sheer white drapery, as well as goose-down duvets, separate seating areas, private balconies, personal DVD libraries, iPod docks, and mosaic-lined bathrooms stocked with L’occitane products. 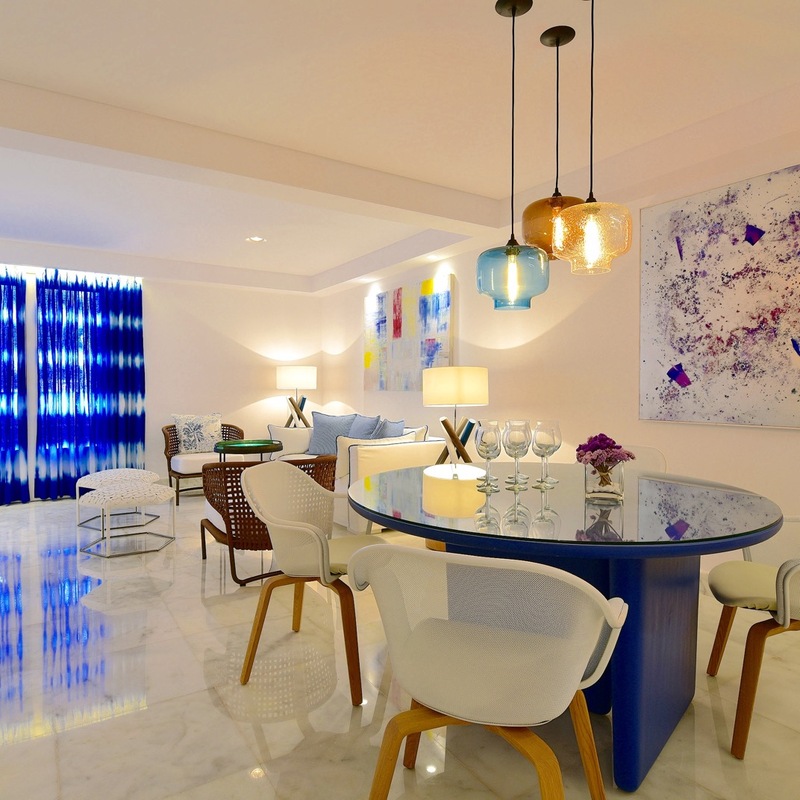 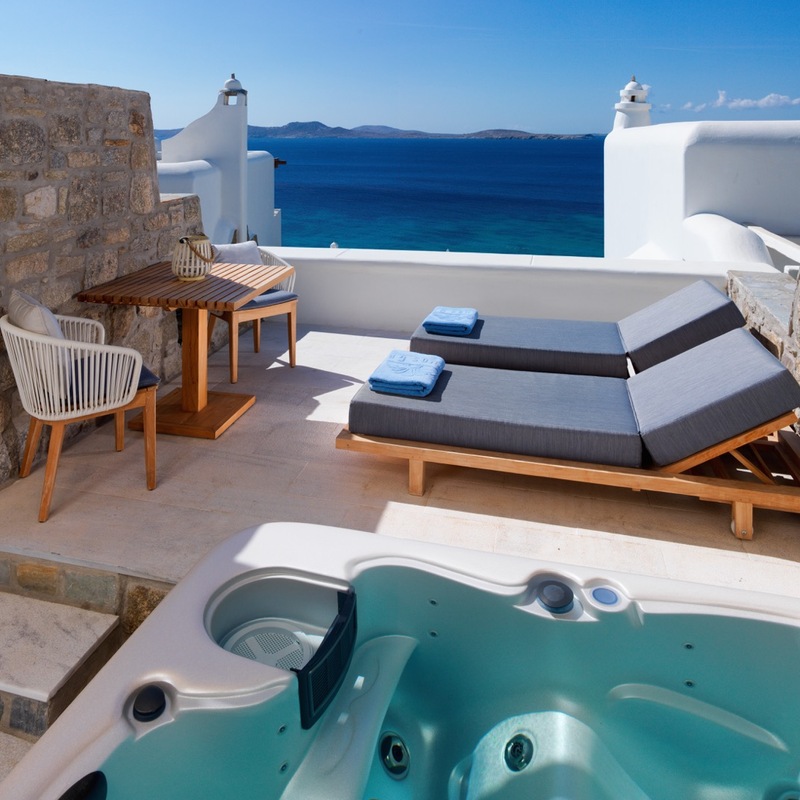 Suites feature extras like Jacuzzi tubs, terraces with panoramic views, even private pools. 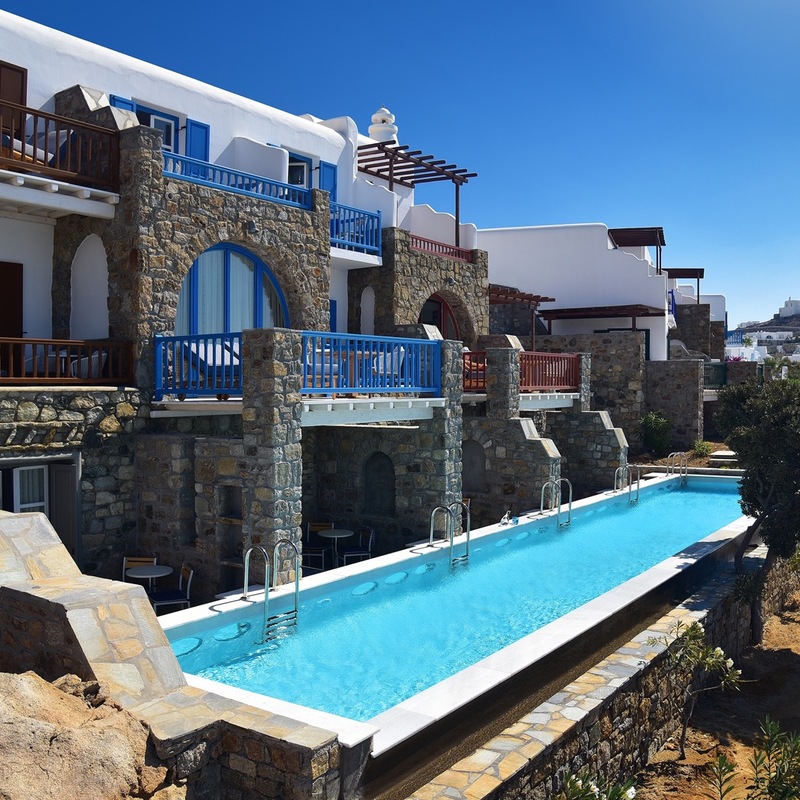 Umbrellas, chaise lounges, and attending staff members await guests on the hotel’s idyllic Shirley Valentine beach. 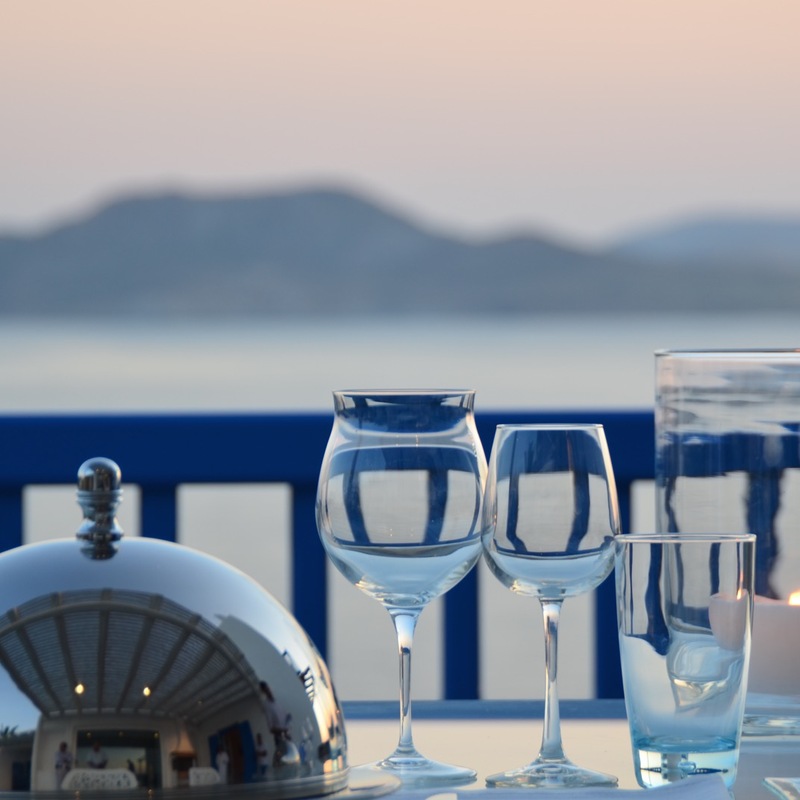 The main restaurant, Dolphins of Delos, offers elegant open-air dining, while the more casual Aqua e Sole features seafood and salads under a wooden pergola by the poolside. 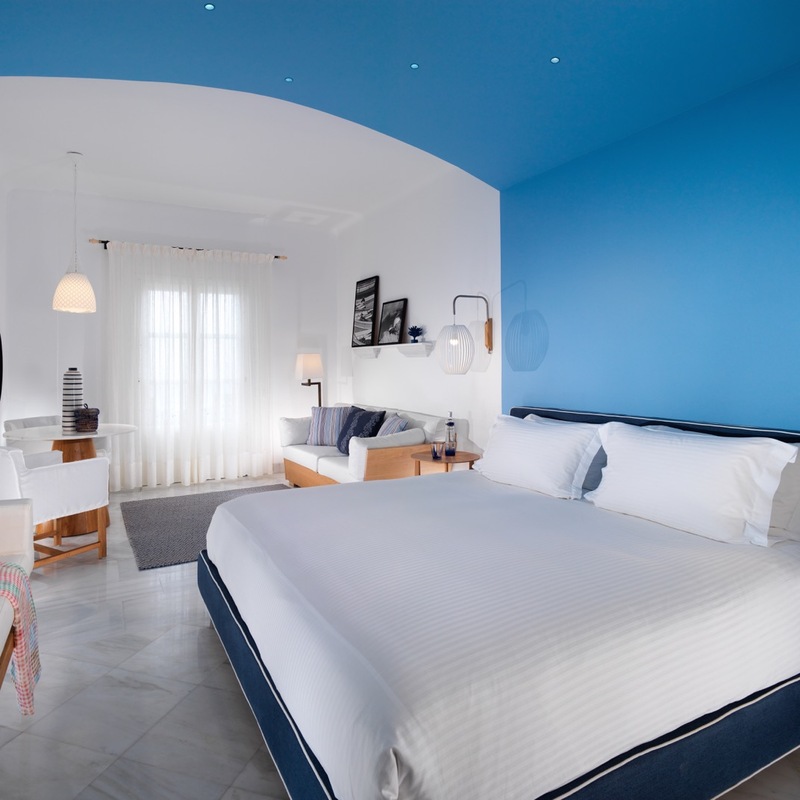 At night, peer through the telescope at the fanciful White Bar, then raise your champagne flute to toast one of those rare moments in life when a little bit of predictability isn’t a bad thing — when the image you had in your mind is exactly what it looks like in person. 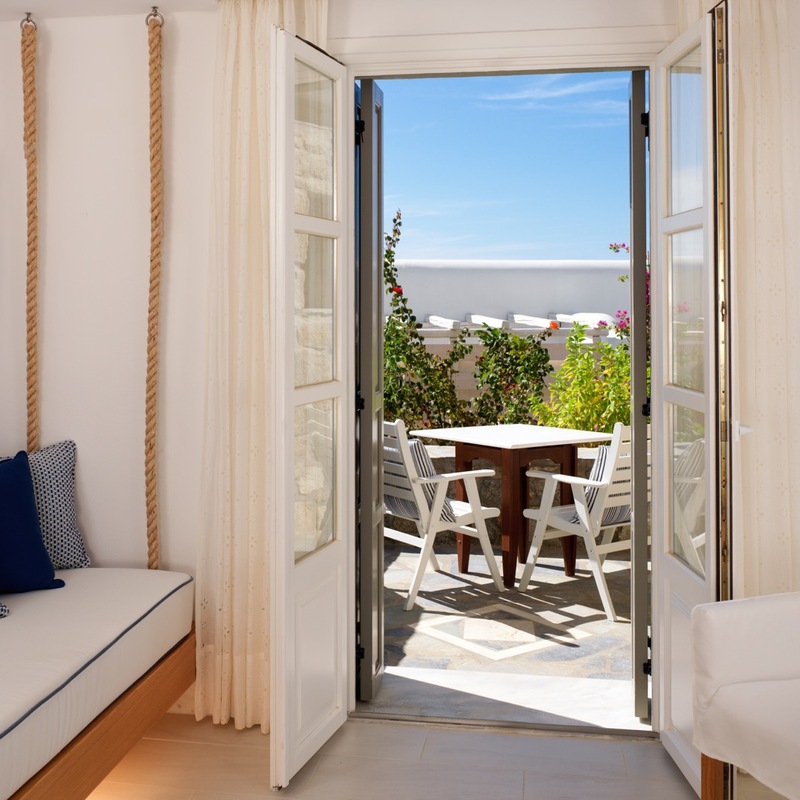 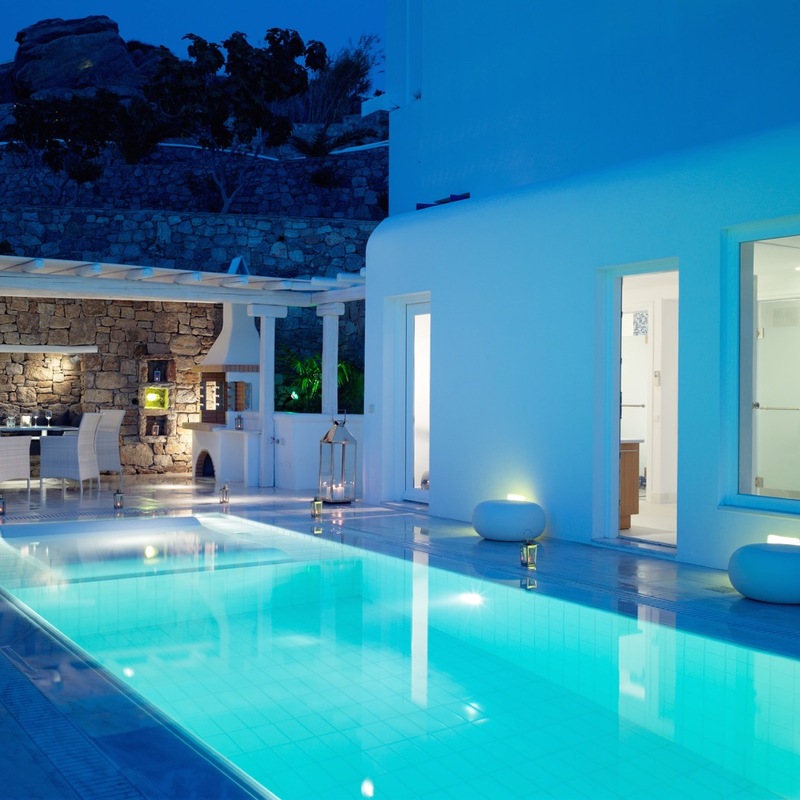 The hotel is located 2.5 miles, about a 12-minute drive, from Mykonos Airport. 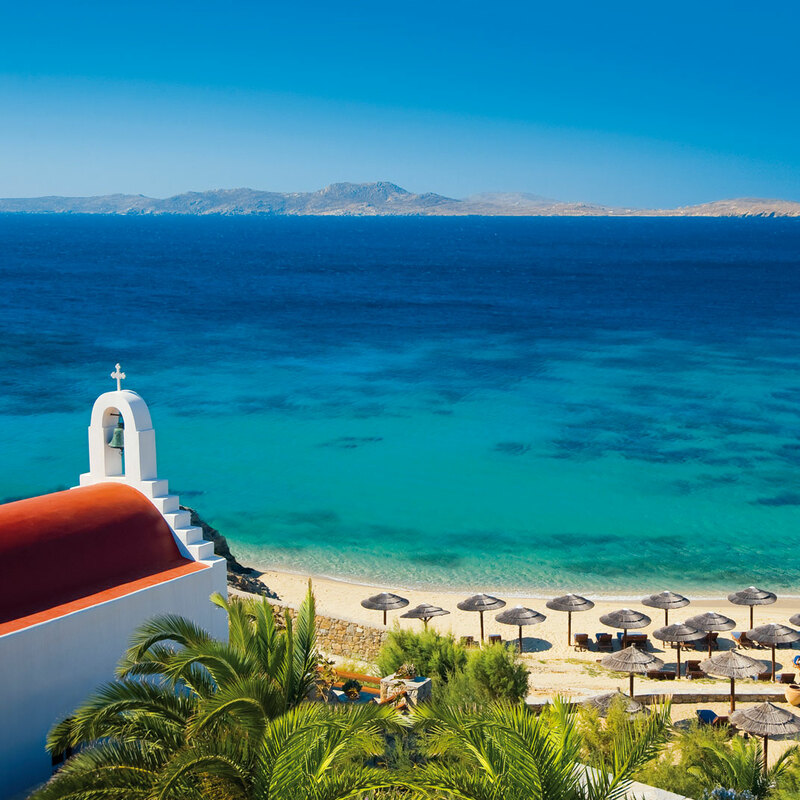 Due to the limited number of taxis, it’s often difficult to arrange a transfer on arrival. 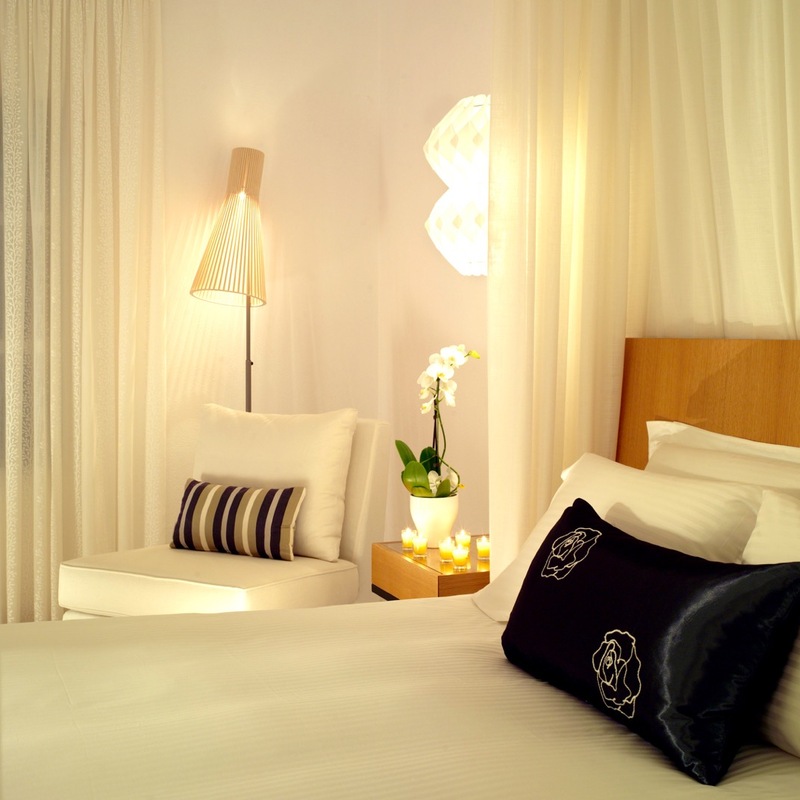 Given prior notice, the hotel can arrange a transfer. 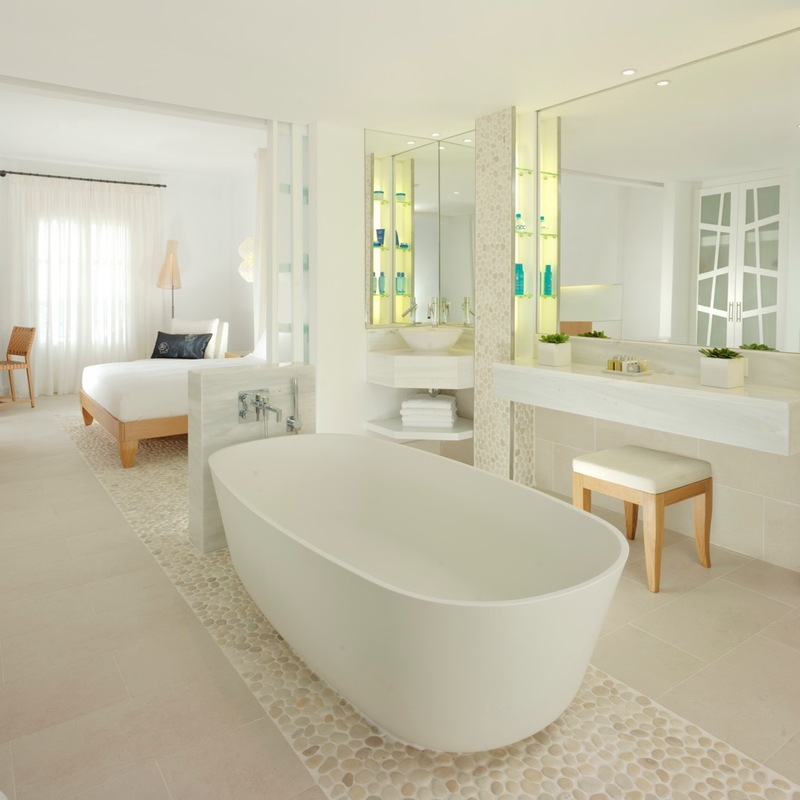 Please contact CustomerService@TabletHotels.com for further assistance. 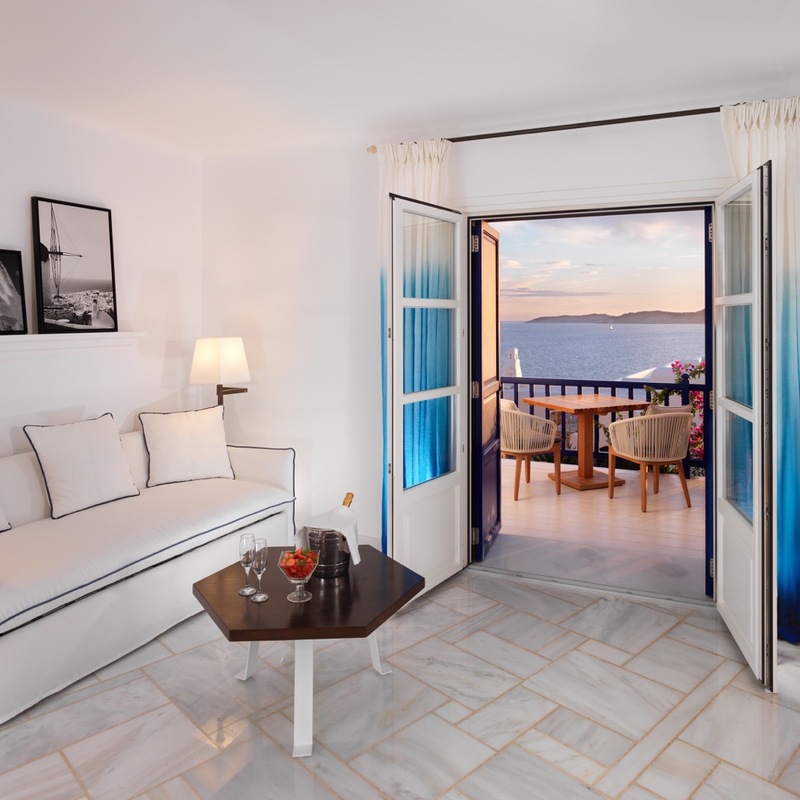 This room is located on the ground floor of the property. 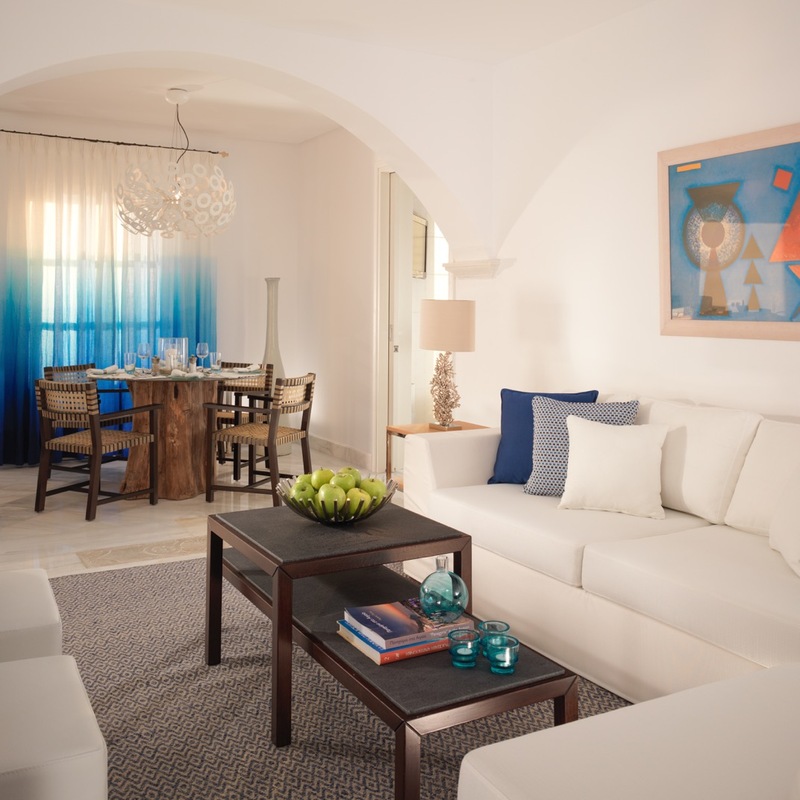 This suite can accommodate 2 extra guest in the living room.